I can’t believe I did it. I had this case on ebay, trying to move it to squirrel away some money for a trip I would like to take, back to Hawaii. I want to share memories of growing up in Hawaii with my kids and selling this case would put a good dent in the cost of Aloha. I had a few offers but they all seemed rather low and they were below actual SOLD cases on ebay. With my counteroffers matching recently sold prices being rejected, I decided… it was time to rip the case and turn this sucker into a product review. During the video playback above, you can tell I was live, I had a few friends online and watching and cheering me on as I ripped through the case. For them and everyone else, I ripped into it like I was doing a break, trying my best to speed things along. A hint to you if you watch it after reading this. I do a quick recap at the end. Also, change the playback speed to 2x, this will make the break go even that much faster. Now to the review. I always like to open Topps Chrome, not as much as Bowman Chrome, but pretty close. I like how flashy it is, how the card actually feels thick and solid in hand, and I love the base refractors, prizms, and various colors. I think the design and photo choices were done well and made it easy for me to read the names, recognized color refractors, and the pop of color on the back of the cards made this set fun to look at. It didn’t shy away from using color and I am happy that this set never really does. In all the rip was fun but I have to be honest, thinking about putting money away from sales of cards from this case, I was bummed. I know the base cards will be fun to collate and possible trade to make a full base set, so that is cool, but boy, I kept thinking about how many shots of Mylanta I would have to take after the camera was turned off. Check out the recap at the end of the video. I think the case was saved, and I hope you enjoyed the video and the information below. A card collecting brand that made its mark in the 90’s is back with the release of this years product from Panini America. Watch Jaxson’s break and review above and I will get the details together below! The National was a great success for me this year. Gone were the pressures of having to actually work at the show. I actually got to walk around and be where I wanted to be at any given moment and that was a true blessing. 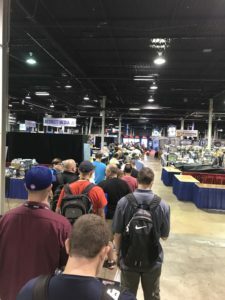 From the moment I hit the National floor, I was working on finding cards, getting wrapper redemption packs, and saying hi to friends I have made through the hobby. Here are some of the periscope video links as I walked through the National and more. Sick 3D Michael Jordan PSA Slabbed card – Owned by The Card Shop in Omaha, they still have it for sale. Thank you to Steve from All Star Sports Cards. I know Tony couldn’t make it and you were kind enough to offer me his badge to both the Convention and to the Panini VIP Party. I had a great time at both and I can’t thank you enough for this. You even got me into the Upper Deck Party and that was a blast. 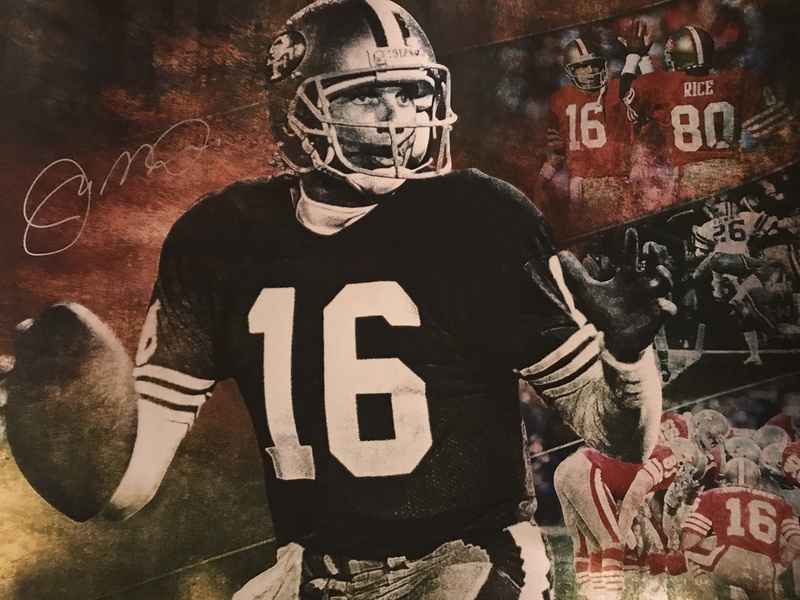 I now have a Joe Montana Autographed Print that will be framed and placed in my man cave. Thanks to Matt and Annette Osman for being great friends. I looked forward to meeting up with you each day I was there at the National. It gave me a great chance to share the experience with someone that would understand my excitement about this industry. Huge thank you to Scott Prusha from Panini. Husker fam right there. I can’t thank you enough for the items you sent home with me for Jaxson. He would have loved attending this National and I won’t be attending any others going forward without my son. Thanks Scott. I hope you enjoy the drawing of GG and it provides some healing as you think of her each day. I have a painting of my Dad that my mother in-law did and each day I stop to say what’s up to him and that has brought a lot of happiness to me. To Jared Kelley. You helped me by creating and capturing a fantastic drawing of GG for Scott. I enjoy your talent and I am so glad to call you a friend. I love your work and hope to have your help in capturing family memories and treasures for me for the long-term future. To Scott Miller, owner of The Card Shop in Omaha. 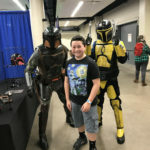 You have been a great friend, supporting me in making a decision to do breaks, and in the beginning, giving me a way to do this and allowing me to continue to enjoy the hobby with an honest and true sense of community and friendship through your shop. I don’t do breaks anymore but that never mattered to you. You have provided great advice and friendship. Thanks so much Scott. I am forever a customer and happy as heck to call you a friend for sure. Last but not least to my wife. I went back and forth about attending this National. I had no reason to go but I was excited by the thought of going and having no commitments. You shocked me when you told me to just GO. I know it was last minute and we even thought about a last ditch effort to get Jaxson out there as well. It was fun, no drama, except my beer would keep disappearing on me before I could really get a good drink at the Panini VIP Party, lol. Maybe I should have taken it as a sign. It is a funny memory and a lesson to hold on to your drink… lol. Mahalo to all of you. Mahalo to you if you are reading this too. You are a part of the hobby that I find fun in. Thank you for stopping by and reading this and if you want, please drop a comment on this post. Oh and before you go, check out the Topps Wrapper Redemption Packs from George for Jaxson below! I took off bright and early from Omaha yesterday and arrived in Chicago to my first day of the National. This will have been the third day of the National and man was it crazy. I arrived shortly before the doors opened at 8:30am for dealers at the National. Thanks to a few friends including Scott from The Card Shop in Omaha and Steve from All Star Sports Cards in Tennessee, I was able to get a badge that allowed me early entry to the show. I can’t thank you guys enough. Once the doors opened, my mission was to check-in with Steve and Scott and to get inline for the highly sought after Topps Redemption Packs. 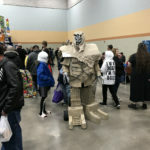 I really didn’t plan to come to the National so I didn’t really have any plans so I am really focused on building friendships and helping others get some things they were searching for from the show floor. That is why I was after the Topps packs. 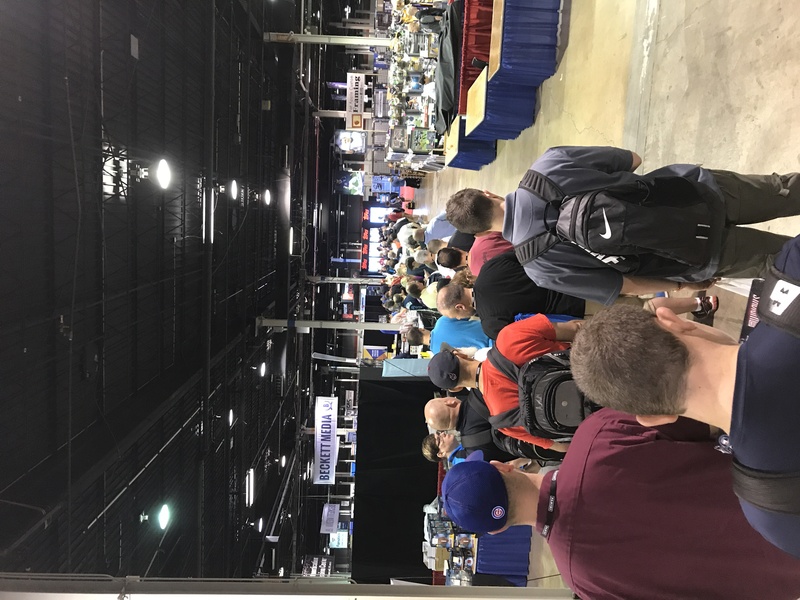 After checking in with Steve I realized that the line at the Topps booth was already forming and having heard that they ran out of the alotted packs the previous day, I kept an eye on it and gave George a buzz to discuss the product he wanted and where to get it. Once a decision was made the product was purchased and I made quick work of getting in line. While there we were told that we may not get any packs as they were likely to run out before we got to the head of the line. We were reminded that there was a strict 16 box limit per person and that was it. If you wanted more you would have to get back in line. No biggie. The line started moving at 10 and by 10:20… they were out. I was fortunate enough to be the LAST ONE and I got 6 packs. Two for three boxes of finest… of which I had a total of 16 boxes. Bummed for not getting the full lot, I was happy I got something for George. Next up, I headed over to see if I could drop off a gift I had for Scott Prisha of Panini who happens to be from Omaha and a Husker fan. I was able to drop off and later have him open it. I think he liked it. There may be a video of it sometime and you guys can laugh as I got choked up when presenting the gift. This to me is part of the hobby experience and why I really do enjoy it. I then made zigzag patterns to see Scott get a quick walkaround the place, swing by with Steve to help him get some Panini redemption packs and… man I am tired just reading this. Thanks to Steve I was able to attend the Upper Deck Party. It was a very fun event with good food and drink and I got to hangout with another collector from my home state of Hawaii, Jeff (JKBreaks). I walked away with some goodies for Steve and a piece for my PC. Exhausted, I got a Lyft, headed back to the hotek and crashed. My day two at the National begins today and I am outside Starbucks waiting for my fix. I hope you find the following information helpful as you plan on your trip to the 2017 National Sports Collector’s Convention. The 2017 National Sports Collector’s Convention in Chicago opens on Wednesday, July 26. Although I won’t be there for the opening festivities, I will be there Friday morning with my VIP badge ready to get in early on the floor and will be hoping on my personal twitter account @r9tee or the @r90sportscards account to share video of the show. In the madness of the show, I hope to remember to use the r90 twitter account but in case I don’t, please follow my personal twitter account too. Here are the things I am hoping to do. 1. Check out the manufacturers’ booths. 2. Check out PSA and Beckett booths to show you the lines and craziness around each. 3. 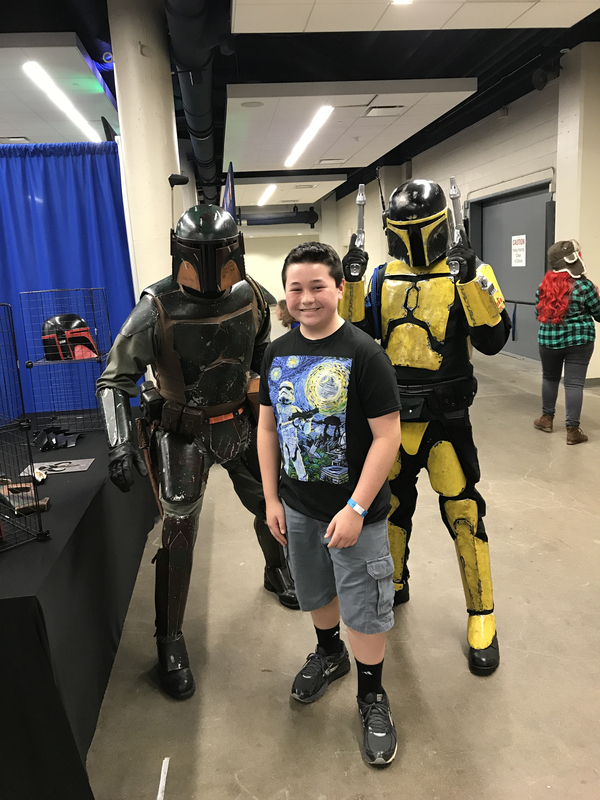 Do a walk-by of the Blowout Cards, Dave and Adams, Steel City Collectibles, and many other online retailer booths. 4. 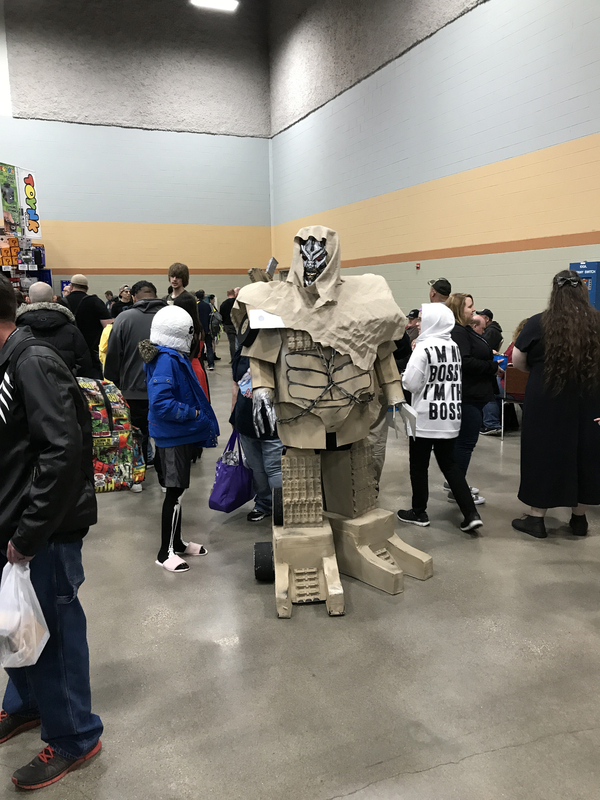 Check out some vintage, modern, and a few other dealer booths to show you the mix of what is there and hope to find some cool items that you may not have a chance to see otherwise. 5. 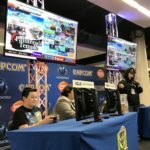 Visit The Breaker Pavilion and the GTS Main Stage. 6. 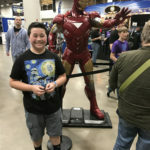 Stop by and chat with the GoGTSLive guys, Rob and Ivan. 7. If I can swing any invites to some of the after show parties, Panini VIP, or some distributor parties, I will try to do video from those as well. If you want anything in particular, want to see if a buddy made it and you want to see them on my feed, let me know. I will see if I can meet up with them and get them on camera! Mahalo and I hope you guys enjoy the show in person or via others at the show. Topps built up the excitement for this release on July 5th. This was a Walmart exclusive release and the date of release, myself and other collectors scurried around our respective towns searching for the product. I struck out on the 5th, but on the 6th, I was successful in finding 2 Collectors Boxes which guaranteed two autos per box, and 4 blaster boxes. I had hopes of busting one Collectors box and listing the rest on ebay. As a matter of fact that is exactly what I did. Check out the video of the break here, I tried Periscope this time on my @r9tee twitter handle. I did have fun busting the product. As expected, the cards are foil cards, with some colored parallels. I had fun catching the little differences in the cards, with prospect names in black, rookie and vet names in white, then looking at the inserts and all that fun stuff. Of course I was chasing Judge and Bellinger and although I didn’t get an auto of either, I did hit some base cards and they did well on ebay. Which was cool. I will be listing what I pulled and hope to come close to breaking even. I hope that you have a chance to bust the product yourself and enjoy the chase, after all, it is a great part of the hobby. What a great design and feel to a set, I have been a fan of the Inception product and wish the market would share my opinion on this set but when it comes to grading, it can be a tough set to really love. I mean love… ha. The set isn’t really deep unless you try to collect all of the color parallels, the base set is just 100 cards in all. I don’t have unlimited funds but this may be a cool base set to put together. With the rise in prices for Aaron Judge rookies, I think I may end up paying more than I would like for his stuff but… well, we shall see if I can make it happen. The cardstock, something I am big on, is nice and feels high-end. as for the design, I think it looks like Topps Magic just before it stopped being produced (I miss that set TOPPS). I enjoyed the break, too bad I didn’t catch it all on video, but the recap, I hope you enjoyed that. If you can stomach the price on this stuff, I think you should give the set a shot, if you do, let me know in the comments below, how you did! Inception Baseball delivers Autographs and Autograph Relic Cards of this year’s most collectible and promising rookies and young stars, right at the start of the 2017 MLB® season. 1 Autograph or 1 Autograph Relic or Patch Card! A checklist offering 100 total cards representing the very best MLB ® superstars, with a focus on the young,up-and-coming players of the game. BASE ROOKIE & EMERGING STAR AUTOGRAPHS: Featuring up to 50 players to collect, showcasing 2017 MLB ® Rookies and rising stars of the game. Autographs will be signed directly on each card. INCEPTION SILVER SIGNINGS: Rookies and young superstars sign directly on-card with silver pens. These cards will fall 1 per case! Base version will be seq #’d. INCEPTION LEGENDARY DEBUT AUTOGRAPHS: Turn back the clock to when these MLB ® superstars first arrived in the big leagues! Autographs will be signed directly on each card. The base version will be seq #’d. INCEPTION AUTOGRAPH RELIC CARDS: Up to 40 subjects to collect featuring 2017 rookies and the hottest young stars of the game. Each card will include the player’s autograph and a large jersey piece. These cards will fall 4 per case. Base version will be seq #’d. Magenta Parallel – #’d – Featuring Jersey Patch Relics! Red Parallel – #’d – Featuring Jersey Patch Relics! Orange Parallel – #’d – Featuring Jersey Patch Relics! Blue Parallel – #’d – Utilizing jersey buttons! Inception Parallel – #’d 1/1 – Utilizing the Majestic jersey logo! INCEPTION AUTOGRAPHED JUMBO PATCH CARDS: Up to 25 subjects to collect featuring 2017 rookies and the hottest young stars of the game. Each card will include the player’s autograph and a jumbo jersey patch piece. These cards will fall 1 per case. Base version will be seq #’d. TEAM LOGO PATCH BOOK CARDS: Up to 20 different book cards to collect! Each book will highlight a player image and an autograph on the left panel and a jumbo team logo patch on the right panel. Card will be seq #’d to 2.
nameplate on the right panel. Card will be seq #’d to 2. LAUNDRY TAG BOOK CARDS: Up to 20 different book cards to collect! Each book will highlight a player image and an autograph on the left panel and a jersey laundry tag on the right panel. Card will be seq #’d to 2. AUTOGRAPH MLB® SILHOUETTED BATTER LOGO PATCH BOOK CARDS: Up to 10 different book cards to collect! Each book will highlight a player image and an autograph on the left panel and an MLB® Silhouetted Batter Logo Patch on the right panel. Card will be seq #’d 1/1. All I can say is OPTI-CHROME! Talk about Razzle and Dazzle. This set is high-end and that keeps me from opening any of it but man. To see this stuff in person. I know why people love it. The patterns were cool and reminded me of those 90’s inserts. Pair that up with some thick card stock and we have a winner here. The only downside to the set in my opinion? The cost per box and the rookie class, well, they could be changed up to give a better value, perceived or not. My favorite cards of the case were the Nebula refractor, base card or not that design is awesome. I would love to have a whole wall using that as wallpaper. The other cards I like were the Diallo patch auto, the McCaw patch auto, the veteran Walter Berry Patch auto, and finally the Bradley Beal Spectacular Swatches. Thanks to Scott at The Card Shop Omaha for letting me bust a case for this review. Please give him a follow on Twitter @cardshopomaha and check out his ebay listings scc_omaha. Thanks for stopping by, register on the site and drop a comment or two, would love to hear from ya! Every autographed card in the program features a swatch of memorabilia and parallels, which are sequentially numbered all the way down to a one of one Nebula parallel. Global Icons Memorabilia Autographs showcases 15 of the most popular NBA players from around the world! Collect Rookie Jersey Autograph cards of the 2016-17 NBA Rookie Class! Spectra is back and features the familiar Opti-Chrome print technology and the color parallels that collectors have come to expect! Spectra offers a wide variety of speci cally themed autographed sets with multiple parallel versions, jumbo-prime swatches, and a spectacular mix of current, retired and rookie NBA players! Collect this latest rookie class the way you want! Every autograph is signed on card, and every player boasts a base version sequentially #’d/300 and parallel versions numbered all the way down to one-of-one! Base set Neon Blue/Pink/Neon Green/Gold/Green/Nebula numbered from 60 to 1. Rookie Jersey Autographs Neon Blue/Pink/Neon Green/Gold/Green/Nebula numbered 99 to 1. Spectacular Swatch Autographs Neon Blue/Pink/Neon Green/Gold/Green/Nebula numbered 149 to 1. Rising Stars Memorabilia Autographs Neon Blue/Pink/Neon Green/Gold/Green/Nebula numbered 199 to 1. Locked In Autographed Memorabilia Neon Blue/Pink/Neon Green/Gold/Green/Nebula numbered 199 to 1. In the Zone Autographed Memorabilia Neon Blue/Pink/Neon Green/Gold/Green/Nebula numbered 149 to 1. Spectacular Swatches Neon Blue/Pink/Neon Green/Gold/Green/Nebula numbered 149 to 1. Catalysts Neon Blue/Pink/Neon Green/Gold/Green/Nebula numbered 149 to 1. Triple Threat Materials Neon Blue/Pink/Neon Green/Gold/Green/Nebula numbered 149 to 1. On average. Non-base cards are included approximately 7 in every pack. As you probably noticed I have had a countdown on the homepage of the site for the National. I had attended the Atlantic City convention in 2016. Prior to that, I had attended the previous years’ in Cleveland and a couple years prior to that, in Chicago. In Atlantic City, I was there to work and get the word out about R90 Sports Cards. 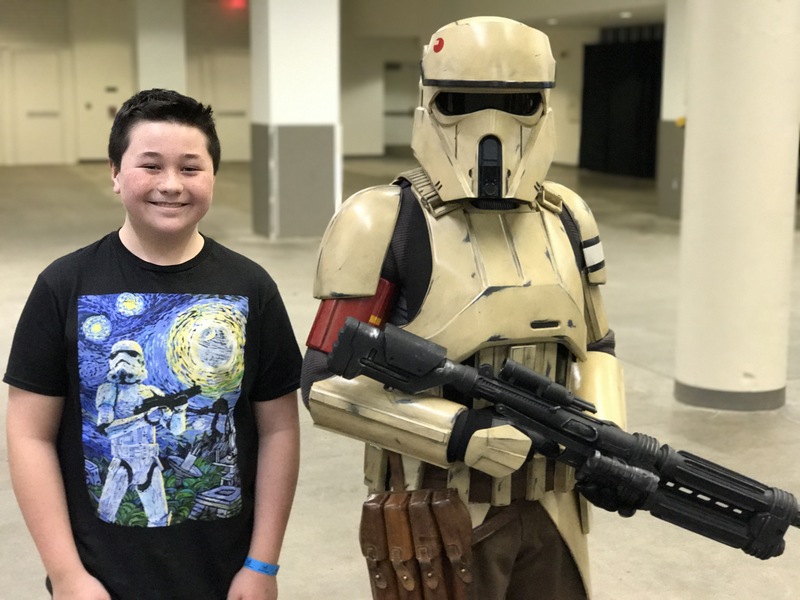 Jaxson came with me and he and I worked to make sure we were present everyday as soon as the doors opened for us and that we were online and hanging out with everyone online as we streamed. There was a lot of activity around the booth. We did break and I pulled my very first superfractor for an attendee that was also celebrating his birthday. It was a cool event and Jaxson and I were worn out when we got home. This year, I will be attending the National on Friday, July 28 through Sunday, July 30. Jaxson won’t be attending which I think he might enjoy as he will have time to hang out with friends and maybe even stay with my Mom and hangout with his cousins. Meanwhile, I will be attending as a … get this… attendee. I will be focused on checking in with manufacturers and some distributors, friends I have made during breaks, and others I have not had the pleasure of befriending as of yet. 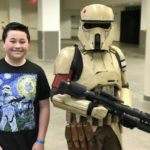 I know attending my first National I had no idea what to expect, or what I should do while I was there. 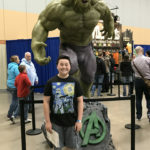 I think it is beneficial for your first time to check out the site for the show and make a list of what you want to do. Oh and very important, set a budget! If you will be there one day or multiple days, set a budget, just trust me. Here is what I have on my list before this show. Say hi to Scott and Tracy at Panini’s booth. Meet and chat with anyone I know from hosting breaks to chatting during breaks. Walk the show floor and take it all in. That’s it for my list. Seems short right? Those are the musts… I have all kinds of things running through my head. Oh and if you are really focused on getting autos from the ridiculous line-up that Tristar has? Please plan that well. The National website has all the information and can keep you updated so please check that site out. If you make it to the National, please let me know you are there, would love to meet ya and shake your hand. I know too many people by their screen names, would be nice to meet the people behind them. See you there and keep checking back on my posts as the countdown to the National and for a post National summary. Alright, now that I am done reminiscing, this set is an update to Series 1. I know collectors are saying, “duh.” I had to say it. So you could find some players who were traded in different unis in this set. I am a big fan of the first pitch insert set and I try my best as I mentioned in the video, to collect the entire set. For the last two years, I can say, I gave it a good go, but never completed them. Something I definitely need to check off my list. As Topps always does, the designs are safe and solid. I don’t know how much farther you can really take a design without impacting the space dedicated to a photo of the player. I think one of the drawbacks I have found with this set, I had a hard time picking out the parallels, after the video, I found a black parallel and I am still searching through to see if I can find any photo variations or shortprints. Oh and I am going to put this out there as text, I would love to see a military “Coming Home” set that features photos of families embracing their soldiers as they meet at the ballpark. I would love to see a set like this. I am guessing I may have missed it and Topps has already done this, but there is an idea for them. I hope to see it in the future with the flagship Topps sets. Overall, I gave this a LOVE rating. Mostly for nostalgia. I can’t hate on this set. I will always be a fan. TOPPS BASEBALL SERIES 2 SHOWCASES THE BIGGEST STARS OF TODAY AND CAPTURES THE MOST REMARKABLE MOMENTS AND MILESTONES FROM BASEBALL HISTORY! AS THE MIDSUMMER CLASSIC™ APPROACHES, TOPPS BASEBALL SERIES 2 CELEBRATES THE GREATEST MLB® ALL-STARS OF ALL TIME AND PAYS TRIBUTE TO AMERICA’S PASTIME WITH MLB® FOURTH OF JULY INSERTS, AUTOGRAPHS AND RELIC CARDS. *I am unsure how long this will last. These packs include refractors, some numbered using the Chrome technology. A checklist offering 350 total cards, showcasing the biggest superstars, hottest young players and rookies in the game! Gold Parallel – Sequentially numbered to 2017. Vintage Stock Parallel – Sequentially numbered to 99. Mother’s day hot Pink Parallel – Sequentially numbered to 50. Father’s day Powder Blue Parallel – Sequentially numbered to 50. Memorial day Parallel – Sequentially numbered to 25. Red Parallel – Sequentially numbered to 25. Platinum Parallel – Sequentially numbered 1/1. Highlighting impact players from MLB® teams. Red Parallel – Sequentially numbered to 10 or less. Recapping some of the greatest moments from Baseball history. Base cards will be sequentially numbered. Celebrating milestone achievements from the 2016 MLB® season. Base cards will be sequentially numbered. Including on-card and sticker autographs from All-Star caliber players and must-have rookies in the game. Maple wood Parallel – Sequentially numbered to 25 or less. Ash wood Parallel – Sequentially numbered to 10 or less. Highlighting impact players from each MLB® team. Gold Parallel – Sequentially numbered to 99. Black Parallel – Sequentially numbered to 50. Silver packs include MLB ® veterans, rookies and retired greats in the iconic 1987 Topps Baseball design – all in Exclusive Chrome Technology! 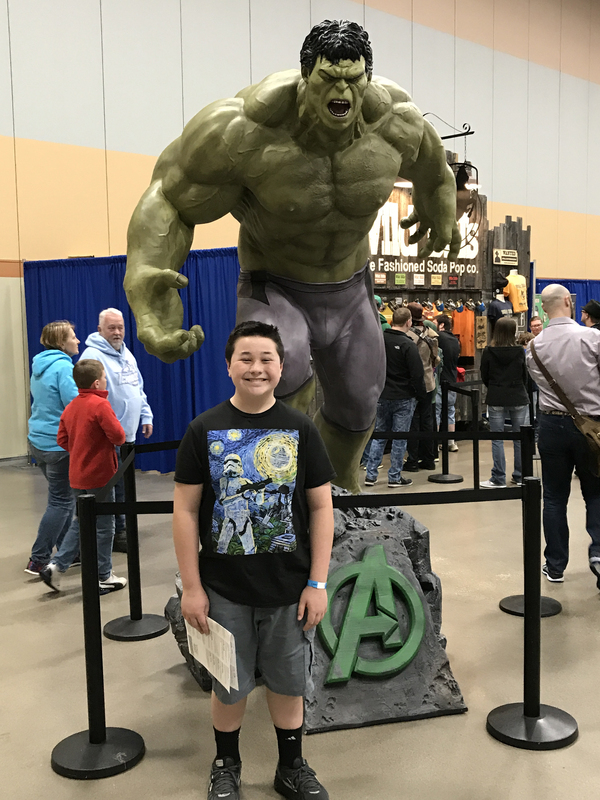 Jaxson and I attended the Saturday show and it was a blast. We woke up early and drove in from Omaha, stopping by Burger King for some grub and getting outta Dodge. The drive was only a couple hours long and nothing but rain… there was some excitement when a State Trooper flipped his lights and came up on us like a bat outta hell. I kept my cool, got behind a semi on my right and he pulled the semi over ahead of us. Not gonna lie, I was a bit concerned… Heart rate up, but that was enough to keep my going the rest of the way. We arrived at our hotel, just a block or two away from the event center to be greeted by the entries blocked by cars and signs saying guest parking only, violators will be towed… I couldn’t for the life of me figure out just how guest were supposed to get in… So Jaxson and I drove around the block and boom, there was a gap just large enough for us to get through and we were in. We got parked, dropped stuff at our room and off we went to the Iowa Event Center. 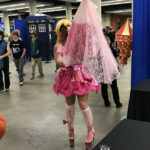 There was no line wrapped around the building and there was minimal cosplay but what we did see were from extremes on the spectrum, you had halloween costumes and then you had the cosplayers that really did it up and I enjoyed those. 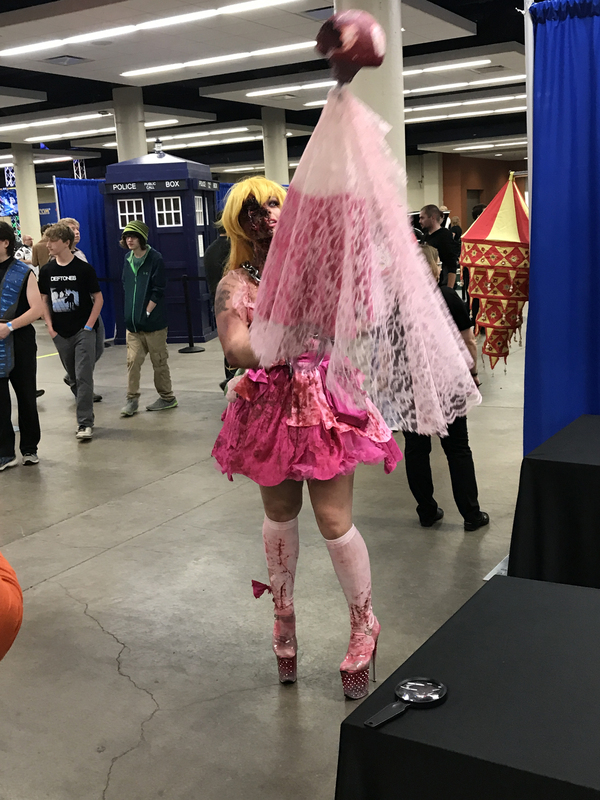 One thing I like about these cosplayers is the willingness to go all out, dressing and playing it up like the character they are portraying. It didn’t matter your body type, I think most people were just in awe of the effort and their ability to buy in and go for it. I applaud all of them. 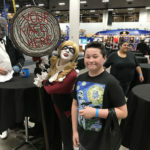 I was very impressed, once we got in line, to be greeted by the CEO of Wizard World, John Maatta. He was awesome. 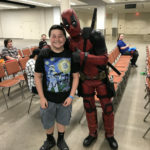 He took the time to stop and shake the hand of all of the attendees and letting them know that we could call him, his number was on a poster in the event, should we find anything we didn’t like or if we needed his assistance. How cool is that. 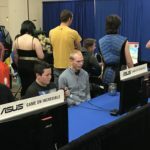 I have never seen this happen before and I think it should happen at every event now… ha. Once in we were greeted by a few cosplayers, you can see the video here of our walkaround the event. 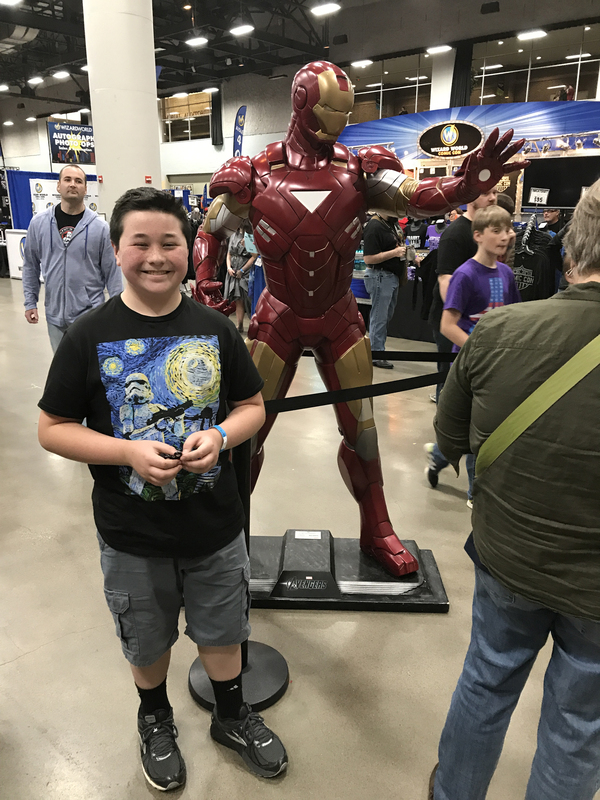 After the video, we did another walk through and stopped by some of the vendors to grab a couple fidget spinners, some dungeons and dragons dice and then it was on to what Jaxson was drawn to once we saw it… the Gaming area. 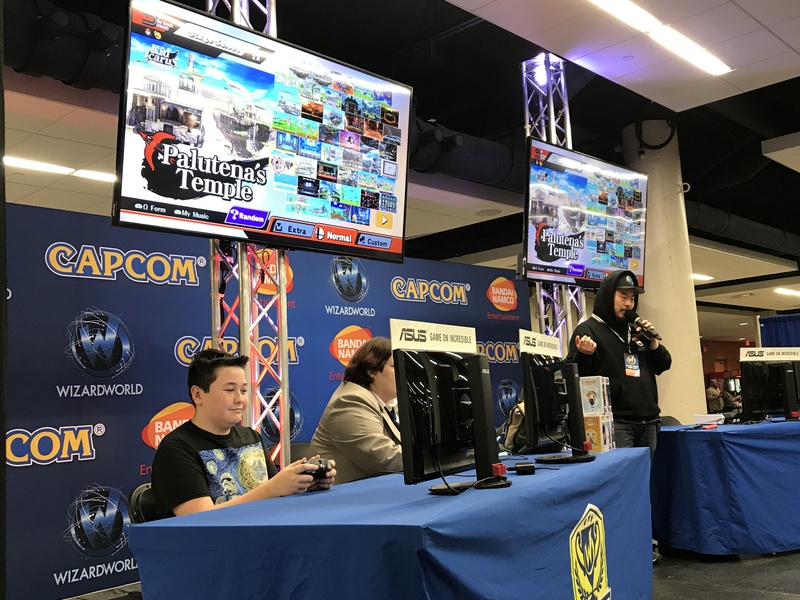 He signed up to play in the free Smash Bros. tournament for a chance to win $100. He played it out, but lost in the double elimination rounds. He said it was fun and that had he known he would have played that game more before the event. We don’t have the system or the game mind you… I was glad he gave it a shot though. 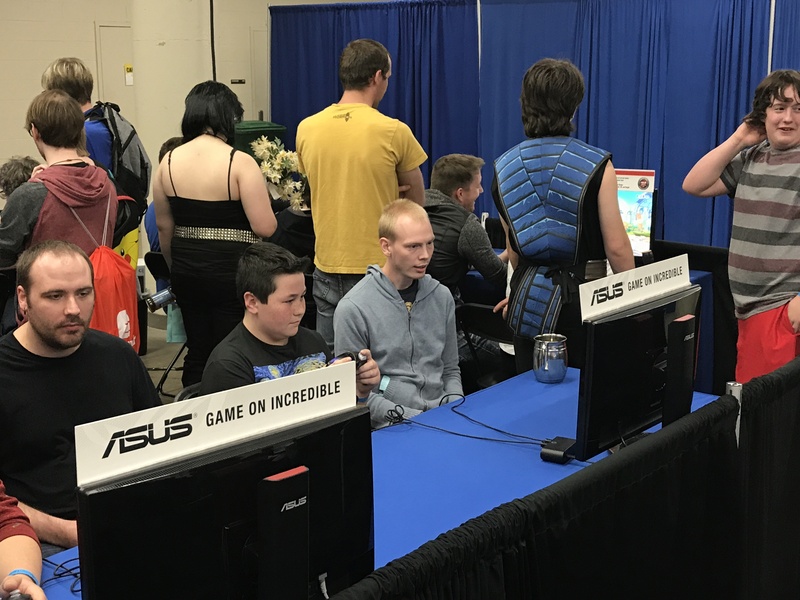 He played games there as a lead up to the tournament and got his fix in before I pulled him away to check things out again. 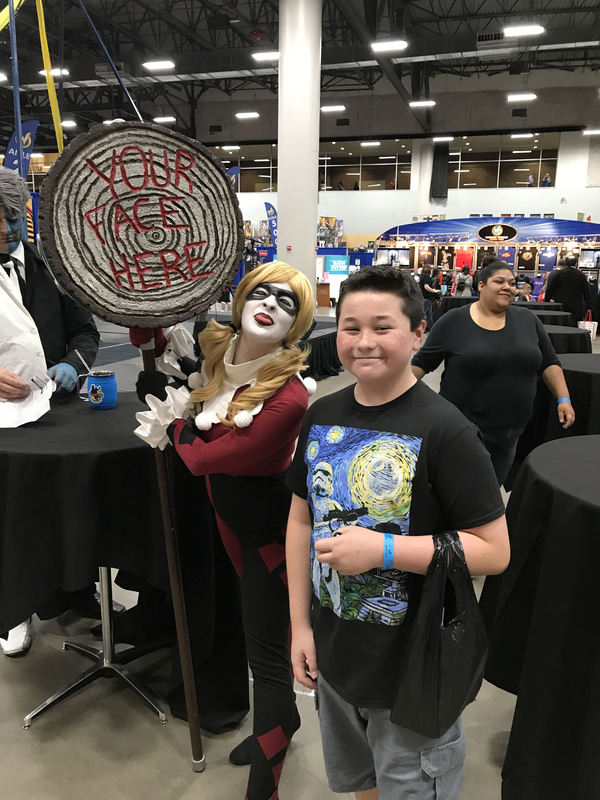 In all I think we did about 13 – 14 laps around the entire event getting photos of Jaxson with some cosplayers. Photos below and another video of the mainstage this time with some dance/something… Catwoman was in a suspended ring… I don’t know… check the video out too. Got him! 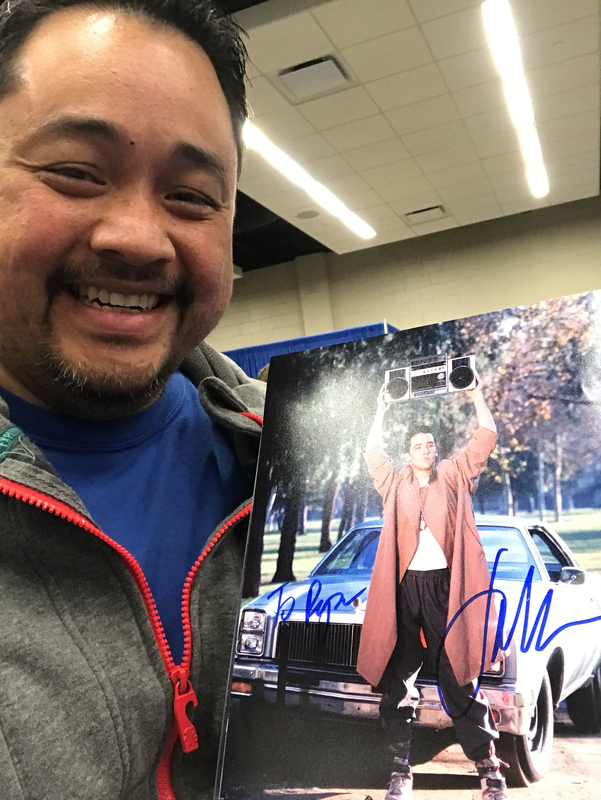 John Cusack Auto… Check! Yes by the way, he says he still kickboxes. We did catch a glimpse of Stan Lee as well but he was surrounded by handlers all loading him up with photos that he signed like a machine and just being able to see the man was cool. Maybe someday we will be able to catch him again and get to shake his hand. Anyway, a great show, hope you enjoy the photos/videos. 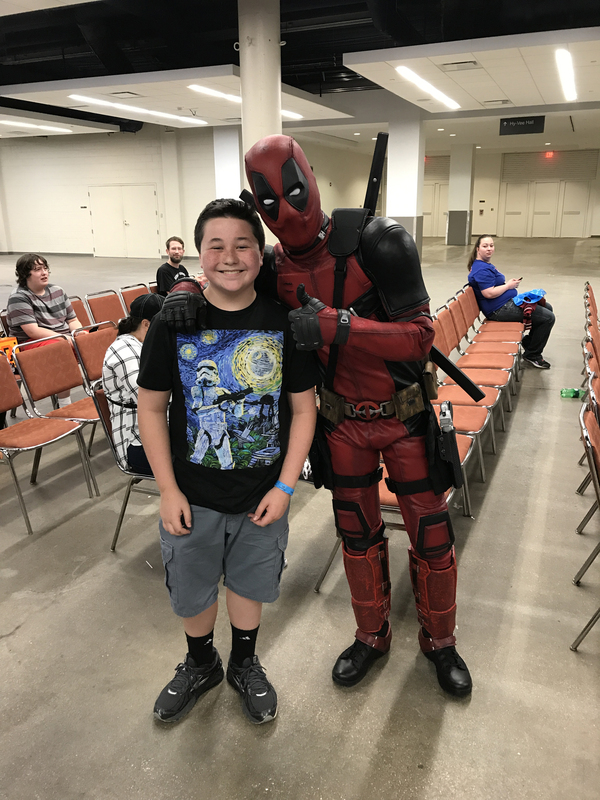 Jaxson and I are heading to Des Moines to catch Wizard World, we will only be able to attend on Saturday but hoping it will be a blast, we will do what we can to make it so. Like our page on Facebook because we might just get on Facebook live and capture some of the event for everyone or if you prefer, follow us on Twitter, maybe we will push video there instead. 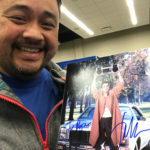 Here is a link to the list of guests, small list but I am hoping to get an auto from John Cusack. The chase is on. I love the Contenders brand and what it means for football collectors. 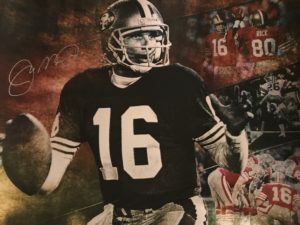 I am not quite sold on college unis but I know that this is our first chance to get autos of players in the upcoming NFL Draft and like it or not, I say if you have a player you want to target, this is THE initial offering set you want to get into aside from the HUGE Fan Favorite Panini Contenders Football (Football’s equivalent to Bowman). Everyone will be on the hunt for the numbered autos of players like Deshaun Watson, Leonard Fournette, Christian McCaffrey, Myles Garrett, and more. Aside from base autos, there are the ever popular, bowl, championship, and cracked ice ticket parallels. Super fun! I like the design as it stays true to the look of a ticket for actual games. I would love to see box toppers included in the set someday that is a keepsake plastic ticket that you can hang on a lanyard, ones like you get if you sit in the club level at some venues. A fun quick break this year with the JUMBO style packs, I appreciate it and I think most will. I know that breakers will enjoy the format. Essentially one auto per pack so for brick and mortars, they can pack it out as a hit a pack and make it more affordable for their local customers. A longtime standout in the Panini family, Contenders Draft Picks College Football returns in 2017 with plenty of autographs! The popular College Tickets subset features autographs from the 2017 NFL Draft and includes sequentially numbered Bowl Tickets, Playoff Tickets, Championship Tickets, Cracked Ice Tickets and Printing Plate parallels. Find rare autographs from college football legends in both Alumni Ink and Old School Colors Signatures. Chase autograph inserts, such as Collegiate Connections Signatures, School Colors Signatures, Passing Grade Signatures and Rush Week Signatures, featuring autographs from this year’s deep running back class. Each hobby box will deliver 6 autographs! 20-card insert Old School Colors Signatures is loaded with signatures from Heisman Trophy winners sporting their college gear! Today’s NFL stars highlighted in their college uniforms! Look for Printing Plate versions, sequentially numbered to 1! Alumni Ink is reserved for only legends of college football from yesterday and today! Look for all of this year’s hottest rookies! Find 6 Autographs, 3 Rush Week, 3 Collegiate Connections, 3 Passing Grades, 9 Game Day Tickets, 6 School Colors in each box! Look for the following Hobby only exclusives: Bowl Ticket seq. #’d/99, Cracked Ice Ticket seq. #/23, Playoff Ticket #’d/15, Championship Ticket seq. #’d/1, College Ticket and Season Ticket Printing Plates #’d/1! Bowl Ticket/Championship Ticket/Cracked Ice Ticket (numbered from 99 to 1) – Season Ticket Printing Plate Cyan/Magenta/Yellow/Black (numbered to 1) – College Bowl Ticket/Playoff Ticket/Championship Ticket/Cracked Ice Ticket (numbered from 99 to 1) – College Ticket Printnig Plate Cyan/Magenta?Yellow/Black (numbered to 1) – College Ticket Variation – College Bowl Ticket Variation/Playoff Ticket/Championship Ticket/Cracked Ice Ticket (numbered from 99 to 1) – Alumni Ink – Collegiate Connections Signatures – School Colors Signatures – Passing Grades Signatures – Rush Week – Collegiate Connections – Passing Grades – Game Day Tickets – School Colors – Old School Colors – On average, non-base cards are included approximately 1 in every pack. Just like the introduction of the Aficionado brand to soccer, this is the introduction of the brand to the basketball offerings from Panini America. The are a lot of products at this price range and here comes another offering. As I mentioned in the 2017 Panini Aficionado review, I like the base set design, it brings back memories of Double Dribble… Outside of that this set looks to be a good entry to mid-level product for the sport. With some cool parallels and different inserts the set is definitely hitting on all cylinders with some 90’s nostalgia in regards to look and feel. Check out the list of rookies, current, and retired stars. This one has piqued my interest and I will be following sales on ebay. I may just be picking up a few cards of my favorite old school players. Definitely a fun break, I am always down with fun inserts and this one scratches that itch. Aficionado features a new textured print technology! Designed, built, and tailored to be a true collector’s product Aficionado showcases the most uniquely designed insert cards of the year! Look for one autograph and one memorabilia card in every box! Collect a 150-card base set, featuring the subsets Global Icons and Inducted! Collect three of the sharpest looking autograph insert cards of the 2016-17 release year! Endorsements features top names in the game, both active and retired, International Ink features players proud of their heritage set against their home country’s flag, and First Impressions features members of the 2016-17 rookie class. Base Set Artist’s Proof/Tip Off – Base Set Artist’s Proof Red/Gold (numbered from 99 to 1) – Global Reach Artist’s Proof – Global Reach Artist’s Proof Red/Gold (numbered from 99 to 1) Inducted Artist’s Proof – Inducted Artists Proof Red/Gold (numbered 99 to 1) Slick Picks/Artist’s Proof – Slick Picks Artist’s Proof Red/Gold (numbered from 99 to 1) – Magic Numbers/Artist’s Proof – Magic Numbers Artist’s Proof Red/Gold (numbered from 99 to 1) – Power Surge/Artist’s Proof – Power Surge Artist’s Proof Red/Gold (numbered from 99 to 1) – Opening Night Preview Edition – Signatures (numbered to 125) – Authentics/Prime (numbered from 175 to 15) – Dual Authentic /Prime (numbered from 299 to 1) – Endorsements/Artist’s Proof Bronze/Gold (numbered from 199 to 1) – International ink/Artist’s Proof Bronze/Gold (numbered from 249 to 1) – First Impressions/Artist’s Proof Bronze/Gold (numbered from 249 to 1) – Craftwork – Innovators – Meteor – On average, non-base cards are included approximately 2 in every pack. This is the debut of the Aficionado brand to the soccer offerings from Panini America. With a checklist of current and retired stars from the pitch, the product has some great designs on the base and insert cards. According the the checklist, the base set is made up of 150 cards, so if you are looking to build the base set, it looks to be achievable with roughly 63 base cards per box at a cost of $110/box. The cards are foil and remind me of the Elite brand of products from Panini America. They have some shine to them and how can you not enjoy that. I enjoyed the card design, especially the close up and game play photos. To some degree the design reminds me of shots from Double Dribble. The inserts, Power Surge, with the lightning background are reminiscent of 90’s inserts that are still a fan favorite in the hobby. I look forward to seeing this product again in 2018. Aficionado, one of Panini’s newest brands, comes to the soccer hobby with the release of 2016-17 Aficionado Soccer. The collection includes soccer’s best and brightest stars shown in action with their club team and/or their national team. Look for the best players in the game today in a variety of special inserts such as Magic Numbers, Power Surge, Craftwork, and Meteor! Also find notable soccer stars of the past in Heroes. Find autographs of your favorite current and retired footballers in Endorsements, International Ink, and First Impressions! Featured players include Cristiano Ronaldo, Neymar Jr, Dele Alli, Renato Sanches, Pele, and Diego Maradona, among others! Aficionado also offers memorabilia cards in Authentics and Dual Authentics. Collect memorabilia cards of soccer stars such as Lionel Messi, Robert Lewandowski, Karim Benzema and Alvaro Morata! Chase unique hard-to-pull cards in Aficionado! The Forza! insert showcases goal celebration photography and falls one-per-case, on average! Also be on the hunt for the ultra-rare First Kick parallel of the base set! The Aficionado base set features a unique design that includes both a close-up photo and an action shot of each player. Global Reach cards highlight players who dominate the international game such as Lionel Messi, Manuel Neuer, James Rodriguez, and Alexis Sanchez! Look for Global Reach Artist’s Proof parallels numbered from 99 to 1! tough card to pull, averaging one-per-case! Aficionado boasts a diverse autograph checklist. Find autograph cards of past soccer stars such as Pele and Diego Maradona, current greats such as Cristiano Ronaldo and Kevin De Bruyne, and budding stars such as Renato Sanches and Dele Alli! All autograph cards are numbered from 149 to 1! Look for sequentially numbered memorabilia cards of the world’s best players in Authentics and Dual Authentics, as well as a Prime parallel edition of both. Featured players include Diego Costa, Lionel Messi, Arda Turan, Jamie Vardy, Clint Dempsey, and many more! Power Surge highlights footballers who play with intensity and power such as Pierre-Emerick Aubameyang, Arturo Vidal, Paul Pogba, and Sergio Aguero, among others. Watch for Artist’s Proof parallel editions, some numbered to 99 (Red), 49 (Bronze), and 1 (Gold)! Collect 10 of the most lethal offensive players in the game today in the very special Forza! insert. This rare card falls one-per-case, on average! Base Set Artist’s Proof (1:2 Packs) – Base Set Artist’s Proof Red/Bronze/Gold (numbered from 99 to 1) – Base Set First Kick – Global Reach Artists Proof (1:100 packs) – Heroes Artist’s Proof Red/Bronze/Gold (numbered 99 to 1) – Magic Numbers (1:8 packs), Magic Numbers Artist’s Proof (1:83 packs) – Magic Numbers Artist’s Proof Red/Bronze/Gold (numbered from 99 to 1) – Power Surge (1:5 packs), Power Surge Artist’s Proof (1:55 packs) – Power Surge Artist’s Proof Red/Bronze/Gold (numbered from 99 to 1) – Authentics/Prime (numbered from 199 to 25) – Dual Authentics/Prime (numbered from 99 to 25) – Endrosements/Artist’s Proof Red/Bronze/Gold (numbered from 149 to 1) – International Ink/Artist’s Proof Red/Bronze/Gold (numbered from 149 to 1) – First Impressions/Artist’s Proof Red/Bronze/Gold (numbered from 149 to 1) – Craftwork (1:5 packs) – Meteor (1:30 packs) Forza! (1:120 packs) – On average, non-base cards are included approximately 1 in every pack.